Will one, or both, be overcome? 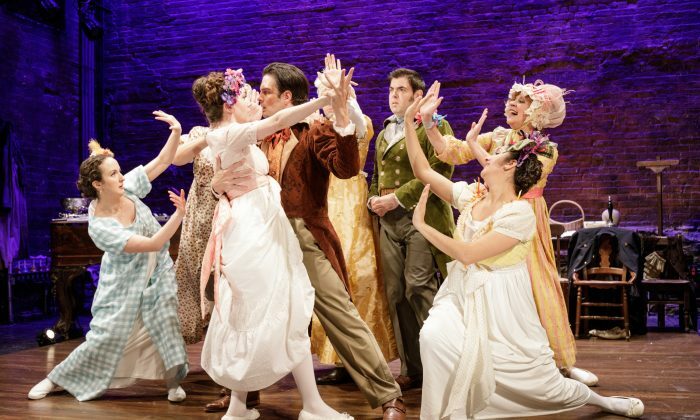 NEW YORK— Adapted from Jane Austen’s noted novel of the same name, actor/playwright Kate Hamill’s version of “Pride and Prejudice” plays as a farce. It thereby loses some of the meatiness of Austen’s work, which delves into, among other things, women’s place in the world—their power or powerlessness. But back to 1813, when the novel was written and set, a middle-class British family, the Bennets, are in crisis. The father, Mr. Bennet (Chris Thorn), is faced with the daunting task of finding husbands for his four daughters. (There are five, but for theatrical purposes, one has been eliminated). Mrs. Bennet (the highly, if not frantically energetic Nance Williamson) is beside herself because she’s just learned that a wealthy and thus eligible bachelor, Mr. Bingley (John Tufts), has moved in close by. To her mind, such a person must be in search of a wife. And Mr. Bennet must do something about it! As it turns out, it’s more a case of the would-be wives searching for a husband. The road to a suitable marriage for these young ladies is a rocky one. Marriage is the only possible solution for a woman’s life in Regency England days. The Bennet family’s finances are so arranged that there must be a male heir. Lacking one, the family will be destitute upon Mr. Bennet’s death. At least one of the daughters must marry into wealth and save the others, or all are doomed. There were no career possibilities for women at that time. If left unmarried, the best a young woman could hope for was to become a servant in a wealthy house: a maid, perhaps, at best, or with the necessary skills, a teacher. So Mrs. Bennet gets her wiles organized and sets out to solve the knotty problem. However, the problem may reside closer to home. One of the girls swears she will never marry. Haughty Elizabeth, called Lizzy (Kate Hamill), is put off by Mr. Bingley’s friend Mr. Darcy (Jason O’Connell). It’s mutual, at least at first. But underlying their meetings is a love-hate intensity. Which side will win out? Lovely Jane (Amelia Pedlow) has feelings for Mr. Bingley. But the entire family is thrown into an uproar when independent-minded Lydia (Kimberly Chatterjee) runs off with the dashing Mr. Wickham (Mark Bedard). Is Wickham simply a vulgar cad, or are the two eloping, with marriage in mind? Underlying the vivacious surface goings-on are burning questions: Does one marry for money, security, or hold out for love? Are women simply pawns of wealthy and powerful men or can they successfully take charge of their own lives and survive and prosper? The co-production (Primary Stages with The Hudson Valley Shakespeare Festival) is a mix of the old with the contemporary. Some current music finds its way in, as well as brief dance numbers (choreography by Ellenore Scott). Performances, under director Amanda Dehnert, are fine, and sometimes hilarious. There’s also good chemistry between Hamill and her vis-a-vis O’Connell. And if one isn’t a stickler for the more typical interpretation of a Jane Austen work, and are in the mood, especially now at holiday time, for something really lively, then this “Pride and Prejudice” in the West Village Cherry Lane Theater, may be just your meat.